Eosinophils are a normal cellular component of the blood and also of certain tissues, including spleen, lymph nodes, thymus, and the submucosal areas of the gastrointestinal, respiratory, and genitourinary tracts. Counts of 0 to 450 eosinophils per cubic millimeter of blood are considered within normal limits. 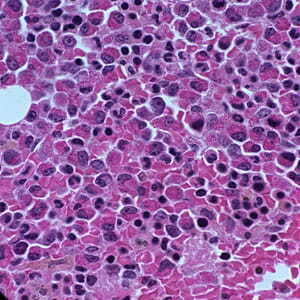 Eosinophilic disorders occur when eosinophils are found in above-normal amounts in various parts of the body. There are many disorders where eosinophils have been found elevated in the blood or in different tissues. General categories of disease that have increased levels of eosinophils range from allergic disorders to endocrine disorders. This bone marrow is literally packed with eosinophils.